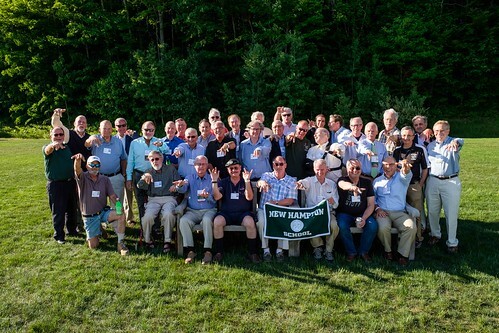 Join us for Reunion Weekend 2019! Registration is now open. Make your plans to join your classmates and friends May 31 - June 2, 2019 in New Hampton for a weekend of memories, fun and entertainment. The full schedule is available to download, as well as lodging information. A special highlight of our Reunion Weekend this year includes a program honoring Jennifer Shackett Berry '83, P'07, '10, '15 during Saturday evening's Dinner Celebration. Jen is retiring at the end of this school year after decades of service as a teacher, advisor, and leader on our campus. Read on below for more about her dedicated history at New Hampton School. Jen also has the honor of being 198th Commencement Speaker for the Class of 2019 at the school's commencement exercises on Saturday, May 25, 2019. To begin your registration, please select the appropriate button below for your class or group. We look forward to welcoming you. Jennifer Shackett Berry '83, P'07, '10, '15 has dedicated over 30 years of service to New Hampton School, offering insight and leadership in many roles from house parent, advisor and coach, to English Department Chair, Director of Studies, and most recently, Director of College Counseling. At this juncture, Ms. Berry will retire from her tenure at New Hampton School to dedicate more time to her family and friends. With Ms. Berry as Director of Studies, New Hampton School embraced curricular growth and initiatives that enhanced the learning of its students through successful technology integration, customized learning opportunities, the addition of the IB DIploma Programme, and skill-based pedagogy. In particular, her guidance in implementing the International Baccalaureate Programme has set New Hampton School apart among New England boarding schools, in its student-centered, academic innovation. Her exceptional connections to students and an understanding of our academic program led Ms. Berry to the College Counseling Office where she implemented a 4-year college counseling curriculum. Alongside this program, Ms. Berry built connections with college admission offices across the country, introducing New Hampton School. Each year, New Hampton School graduates matriculate at a robust list of colleges, whose variety represents the best fit for each individual student. Beyond her tireless work ethic and unending dedication to our school, Ms. Berry has dedicated her professional career to her students. Always willing to have honest conversations, she has been a confidant, mentor, role-model and teacher to every one of her students. She will be deeply missed and always appreciated by all of us at New Hampton School and we are delighted to honor her work and contributions at our 198th Commencement. Ms. Berry will retire to her home on Gordon Hill in New Hampton with her husband, Tom. They have three children who are also graduates of New Hampton School, Kelsey '07, Emma '10, and Hayden '15. Jen’s favorite leisure time activities involve spending time with her family, playing golf, skiing, cooking and traveling to new places. Ms. Berry is a 1987 graduate of Colby College. Each year as a part of the Reunion Weekend celebration, several alumni are honored with awards for their achievements, service, and participation. Please check back for additional Award years as we add details to the website!